Hank Haney is one of the most well-respected and sought-after golf instructors in the world today. He is famous for rebuilding the swing of the world`s #1 player, Tiger Woods. He has also worked with hundreds of top touring professionals, including Masters and British Open champion Mark O`Meara, who says that "Hank knows more about ball flight and what controls it than anyone in the game." Hank Haney`s students have won every major tournament in professional and amateur and junior golf. In Hank Haney`s Essentials of the Swing, Hank shows you how to put his approach to work to develop a powerful, repeating swing that can hit every kind and shape of shot — with every club in the bag — with equal ease and with the consistency of your dreams. He goes beyond tips and quick fixes to lay out the principles behind the ideal swing, along with a plan to help you develop yours. Point by point, he guides you through every aspect of your swing, beginning with the grip; moving through stance, posture, and alignment; and on to the backswing, forward swing, contact, and follow-through. Hank knows that you can never truly understand his instructions until you get out there and follow them. That`s why he leads you step by step through practice sessions at the range, helping you get a feel for how minor adjustments affect ball flight and how to make these adjustments while maintaining that strong and consistent swing. In no time, you`ll begin shaping your shots like a pro—deciding where you want the ball to go and executing the shot to get it there. The place you`ll really put your new swing to the test is out on the course. Hank walks you through a pre-shot routine that helps you plan each element of your shot, making the best club selection, eliminating tension, checking alignment before your swing, and preserving the essentials of your swing in any lie, with any club, and with any type of shot. 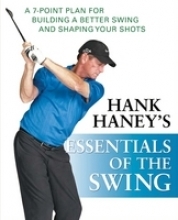 Complete with more than 160 pictures to help you understand the concepts, check your form, and make corrections as you practice, Hank Haney`s Essentials of the Swing is a masterwork from a master instructor. It`s the resource you`ll return to again and again as you improve your swing, become an expert shot shaper, lower your handicap, and reach the height of your game. 8. Working the Ball/Shaping Shots.